Plastic bevelers, corner rounders and scoring aids help sign blanks blossom. Many of our clients consistently use just a few sizes of sign blanks, and prefer to have us prepare their sign blanks to their requirements. 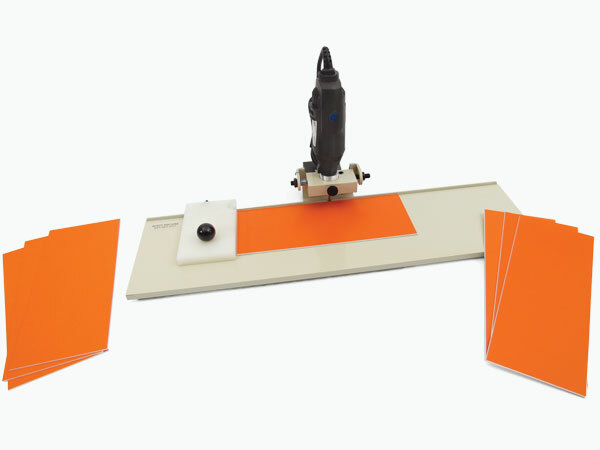 But if your sizes change often, our easy-to-operate bevelers, corner rounders and other cutting and finishing machines are the perfect solution. Simply order sheets or half-sheets of engraving plastic, then cut them to size, when you need them, in a matter of seconds. Check our Catalogs & Prices for illustrated, priced catalogs of all of our machines. 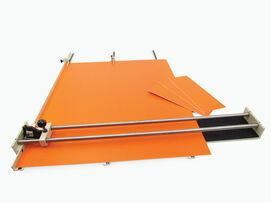 Here's an economical aid for cutting sheets of engraving plastic into sign-sized panels. Simply place the sheet into the fixture, then safely slide the scoring tool along the rails to cut a shallow groove into the surface. Remove the panel, bend it along the scored line - and it pops apart, leaving a smooth, burr-free edge with a professional appearance. Cut down on the costs of custom sign blanks. A beveling machine trims away - "bevels" - the top edge of your name tag blank to expose the core color for an enhancing look. 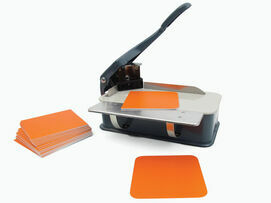 Simply slide your name tag blank along the worksurface, and the safe, quiet motor does the rest. With merely a 3" x 12" footprint, the device stores easily on your bench next to your engraving machine. Attaches easily to standard 1 1/4" vacuum tubing. 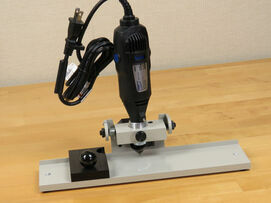 Refine the edges of your engraved safety signs and office name plates with this versatile desktop beveling machine. 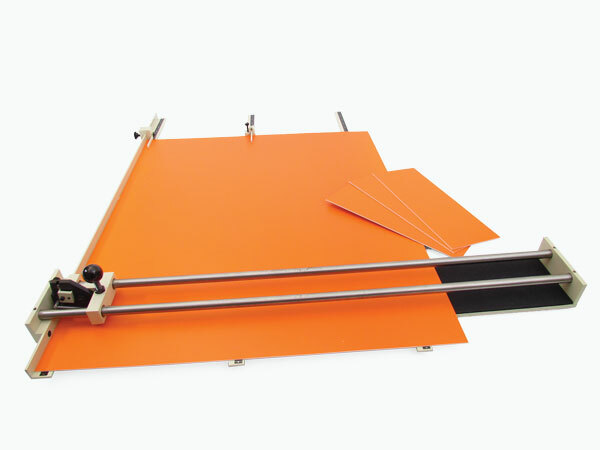 The smooth, 6" x 22" aluminum table and the nylon guide allow you to reliably slide your sign blank (1/16" or 1/8" thick) beneath the safe, spinning beveling tool. The result is a 45-degree accent highlight that exposes the eye-catching core color. The chip shroud is integrated to the motor mount and attaches to common 1 1/4" vacuum lines for clutter-free operation. Consider an attractive rounded corner as an alternative to a beveled edge. Place the square corner of your flexible engraving plastic sign panel into the enclosed die, press down and...in a single stroke...create a corner with all-around style. Change the dies in just moments to create these popular radii: 1/8", 1/4", 5/16" & 3/8". Unsuitable for metals and rigid engraving stock. For clients in remote locations, keep a few sheets of materials on-hand and use these tools to create professional-quality sign blanks on-the-spot.